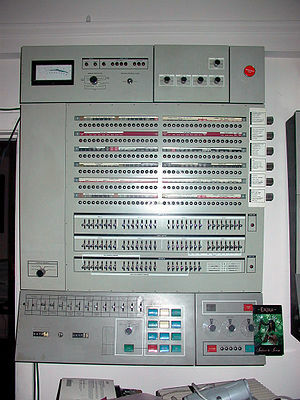 The IBM System/360 Model 65 is a member of the IBM System/360 family of computers. It was announced April 1965, and replaced two models, the Model 60 and Model 62, announced one year prior but never shipped. It was finally discontinued in March 1974. There are six models of the 360/65. :5 They vary by the amount of core memory with which the system is offered. The G65, H65, I65, IH65 and J65 submodels are configured with 128K, 256K, 512K, 768K or 1M of core memory, respectively. By 1974 the smallest G model had been discontinued. The MP (multiprocessor) model was added supporting from 512K to 2MB of system memory. The system can also attach IBM 2361 Large Capacity Storage (LCS) modules which provide up to 8MB of additional storage, however with a considerably slower memory cycle time of 8 microseconds compared to the 750 nanoseconds of processor storage. The performance of the Model 65 is more than triple that of a 360/50, whereas the Model 75, the next step up, was less than double that of a 360/65. The Model 65 implements the complete System/360 "universal instruction set" architecture, including floating-point, decimal, and character operations as standard features. It offers optional compatibility features to permit emulation of the IBM 7040 and 7044 and the IBM 7090 and 7094, the IBM 7070 and 7074, and the IBM 7080. Main memory in the Model 65 can be interleaved for faster access. The Model 65, like the Model 67, was available in a dual-CPU offering. Multi-processing (Dual-CPU) systems have two I65s, IH65s or J65s, and "the main storage of each processing unit is accessible to the other." The Model 65 supports BPS, DOS/360, TOS/360, and OS/360 - PCP, MFT and MVT. MVT was a fairly typical choice of operating system for the Model 65. A special version of MVT, called MP65, is needed for the multi-process (dual CPU) Model. MP65 uses special CPU-to-CPU/Multisystem mode instructions, such as Write Direct. The Model 65MP implements asymmetric multiprocessing: "certain input output equipment is accessible from only one processor." Time-sharing can be provided on a Model 65 using IBM's Time Sharing Option (TSO). ^ Pugh et. al., Emerson (1991). "Appendix A - System Introduction Dates 1964-1977". IBM's 360 and Early 370 Systems. MIT. ^ Elliott, Jim. "IBM Mainframes - 45+ Years of Evolution" (PDF). ibm,com. Retrieved Feb 27, 2018. ^ a b c d e IBM System/360 Model 65 Functional Characteristics (PDF). September 1968. A22-6884-3. ^ a b IBM Corporation (Jan 1974). IBM System/360 System Summary (PDF). pp. 6–11–6–12. Retrieved Feb 27, 2018. ^ Padegs, A. (September 1981). "System/360 and Beyond". IBM Journal of Research and Development. IBM. 25 (5): 377–390. doi:10.1147/rd.255.0377. ^ IBM System/360 Special Feature Description-709/7040/7044/7090/7094 II Compatibility Feature for IBM System/360 Models 65 and 67. IBM. A27-2715. ^ IBM System/360 Special Feature Description-7074 Compatibility Feature for System/360 Models 50 and 65. IBM. A27-2717. ^ IBM System/360 Special Feature Description-7080 Compatibility Feature for System/360 Model 65. IBM. A21-2116. ^ Dave Morton (September 2011). "IBM Mainframe Operating Systems: Timeline and Brief Explanation For the IBM System/360 and Beyond". Retrieved September 19, 2016. ^ AFIPS Conference Proceedings, Volume 40. AFIPS. 1972. p. 591. Retrieved Feb 27, 2018. ^ IBM System/360 Operating System: Time Sharing Option Guide (PDF). IBM. July 1972. GC28-6698. This page was last edited on 26 February 2019, at 01:19 (UTC).